Numerous efforts are under way to restore floodplains throughout the state to capture stormwater. The projects simply aim to reconnect rivers with their historic floodplains — long isolated by levees and land development — but require a different way of thinking about farming and land management. In the arid agricultural expanse of the southern San Joaquin Valley, there was once water for miles in every direction. Tulare Lake – once the largest lake west of the Mississippi River – covered 600 square miles of land near Bakersfield and provided life for waterfowl, fish and native Californians. Following the arrival of European Americans, the lake didn’t last long. Aggressive irrigation quickly drained this wildlife haven as cotton fields drank up its water. By 1920, Tulare Lake was gone. Many Californians today have no idea it was ever there. Now, Steve Haze wants to bring water back to the parched basin. The program director for a nonprofit group called the San Joaquin Valley Leadership Forum, Haze wants to see surplus water redirected from nearby waterways during wet winters and sent into the dry lake bed. Some of the water would remain on the surface, while some would percolate into the ground, where it would fill the aquifer space currently punctured by countless wells. Today, the old Tulare Lake bed is covered with cotton, row crops and — increasingly — almond trees. In all, the Delta-Tulare Water Plan, a concept initiated almost a decade ago, could add 1.1 million acre-feet of extra water to California’s seriously depleted supplies, Haze says. That’s a bit more water than the full capacity of Folsom Reservoir. Haze said the plan has numerous advantages over the giant water diversion tunnels proposed by Gov. Jerry Brown in the Sacramento-San Joaquin Delta. Dubbed California WaterFix, the $15 billion plan calls for two massive tunnels that would divert a portion of the Sacramento River’s flow underneath the Delta and directly to existing state and federal pump and canal systems. Those systems exist, in part, to serve farms in the same Southern San Joaquin Valley region where Tulare Lake once thrived, and where groundwater is now severely depleted. Haze estimates his plan will cost $450 million, mostly to build linkages between the old Tulare Lake region and existing flood-control and water-supply canals. He hopes to secure funding from Proposition 1, the $7.5 billion water bond approved by California voters in 2014. California’s vast Central Valley was a massive floodplain for millennia before it was drained and converted to farmland. Those floodplains are the mechanism that created the region’s groundwater reserves: When rivers spilled over their banks in winter, they created an enormous sheet of slow-moving water that slowly filled groundwater aquifers and provided abundant wildlife habitat. The El Niño weather phenomenon expected to play out this winter has many California water agencies thinking again about floodplains. If big storms come this winter, the heavy rainfall could be distributed over the land to ease flood risk and slowly refill depleted aquifers. Elsewhere in California, as El Niño tightens its grip on the Pacific Ocean, farmers, water delivery agencies and environmental groups are thinking about how to take advantage of what will probably be the wettest rainy season in years – and one of the hottest ideas around is that of capturing surplus flows, escorting the water onto vacant parcels of land, and letting it sink underground. Already, floodplain restoration projects of this nature are under way on the Los Angeles River, the Santa Clara River in Ventura County, the Russian River, and throughout the Central Valley. Several are heavily backed by the Nature Conservancy. Such projects are not incompatible with farming. Many farm fields are idle in winter. In other cases, new research is showing that some crops can sustain shallow flooding in winter months when crops are largely dormant. 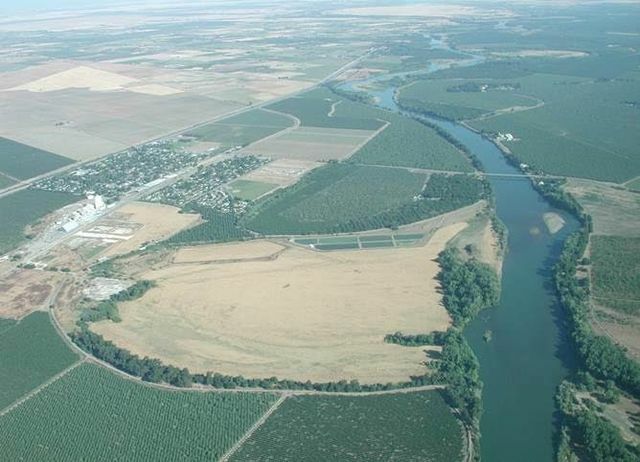 In the eastern San Joaquin Valley, one project supported by the California Water Foundation proposes flooding farmland in winter over a large area between Fresno and Merced. According to an October report by RMC Water and Environment, the project could store as much as 52,000 acre-feet of water in underground aquifers annually. The idea behind these projects, says Graham Fogg, a professor of hydrology at UC Davis, is both to provide habitat for fish and wildlife and also store water that would otherwise race downstream and escape into the ocean. While a certain amount of water flowing through the Delta and out to sea is required to protect the estuary and its native species, the floodplain projects being discussed would make use of surplus, unallocated stormwater – water owned by nobody. Fogg estimates the underground storage space available in the Central Valley is about 13 million acre-feet – roughly the capacity of the state’s four largest reservoirs. That underground supply has been drained by agricultural water pumping that continues to outpace recharge flows. This deficit spending of our water could be reversed, he says, but it will require undoing basic flood control measures – especially the thousands of miles of levees that snake through the Central Valley. “Today, most of our rivers have levees right up against the stream bank,” Fogg says. Such rivers, as hydrologists often say, are “straitjacketed,” confined to fast-moving channels that look neat and tidy from an engineering perspective, but which are ecologically sterile and unproductive. Prior to 1850, vast swaths of marsh and forest rimmed the Central Valley’s rivers, an ecosystem that thrived on the water that spilled regularly over the rivers’ banks. These floodplains remained inundated for months of each year, providing important feeding areas for fish and birds. Sacrificing those once-vast wetlands in the name of development and flood control has not only eliminated an important source of groundwater recharge, but has also been devastating for Chinook salmon, says Carson Jeffres, a researcher with the UC Davis Department of Watershed Sciences. He notes that although expensive fish hatcheries produce millions of juvenile salmon each year — mitigation for construction of dams that cut adult fish off from upstream spawning habitat — almost none of the young fish survive once released into the river. “We’ve been spending lots of money on spawning habitat, but that’s just one part of their life cycle,” Jeffres says. Young salmon thrive in flooded wetlands. The shallow water rapidly becomes productive breeding habitat for insects and aquatic life that feed fish and birds. The water offers plenty to eat and shelter from predators. Jeffres says unless floodplains are restored extensively along the entire length of the Sacramento River, California’s Chinook salmon will continue to struggle. Jeffres has been collaborating with the group California Trout on floodplain restoration for several years. Their biggest project currently is just north of Sacramento in part of the Yolo Bypass, a flood-control channel adjacent to the river. It could restore natural flooding cycles to about 25 miles of land along the river. Logistically, the project is simple: A levee constructed about a century ago needs to be notched down several feet. This way, when the river rises just slightly, water will gush into a vast sprawl of flat seasonal cropland within the Yolo Bypass. 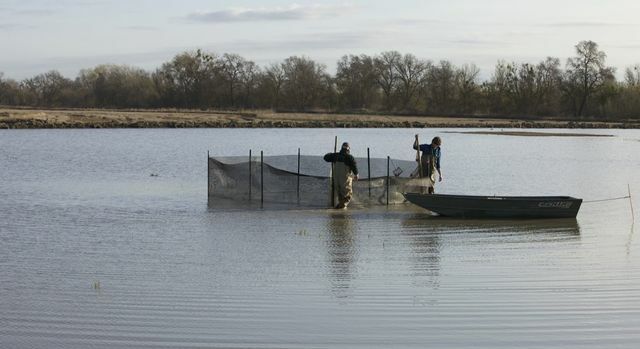 With the cooperation of federal and state agencies, Jacob Katz, a biologist at California Trout leading the project, water could flow through the Yolo Bypass several inches deep this winter. Aside from providing benefits to ecology and groundwater, allowing rivers to flood over their banks can itself serve as a form of flood control. While dams and levees are the conventional means of controlling winter deluges and creating summer water supplies, Katz says annual, natural flooding cycles can produce much the same effects. Surplus water, he explains, sinks into the ground, where it can be accessed later via wells, while pressure on crucial urban levees is reduced as water spills across uninhabited acreage. Katz believes this principle will be critical to California’s future. The Nature Conservancy is in the process of creating a floodplain near Hamilton City. The town of 1,700 people along the Sacramento River was built more than a century ago on drained floodplains. Though protected by a levee, Hamilton City is hardly safe. The levees are weak and unstable, says Ryan Luster, project director with the Nature Conservancy. Six times in the past 30 years, he says, Hamilton City residents have been forced to evacuate during high flow periods. The Nature Conservancy project calls for building a new levee hundreds of yards back from the existing one. The old levee will be demolished. This will allow the river to sprawl across 1,500 acres of uninhabited land during flood stages – a mechanism Luster says will lessen pressure on the levee protecting the town. “Floodplains serve as natural pressure valves on rivers that allow the water to spill outward during high-flow periods,” he explains. The Nature Conservancy has spent 16 years and $18 million purchasing the expensive almond groves that currently occupy the planned floodplain. Building the new levee is the final leg of the project and could take five more years, Luster says. The conservancy has also preserved more than 3,000 acres of floodplain along 15 miles of the Santa Clara River, in Ventura County, and is working on a project along the Cosumnes River, east of the Delta. Here, an intentional levee breach several years ago opened up hundreds of acres of land purchased by the conservancy to renewed flooding. Fogg, who has been monitoring nearby groundwater wells, says heavy rain in December 2014 caused an immediate rise in the local water table at the Cosumnes site. “The data suggest that there’s significant recharge that can come from regular floodplain inundation,” Fogg says. He says the porous ground beneath the Cosumnes floodplain alone could absorb tens of thousands of acre-feet of water. Snowpack has historically been California’s most important reservoir. In the coming century, however, warming temperatures attributed to climate change are expected to shift precipitation towards more rain than snow, significantly reducing the amount of water stored in the mountain snowpack. What this means, Fogg says, is that surplus water must be ushered onto broad expanses of the Central Valley and allowed to percolate underground.